November is Epilepsy Awareness Month! While I try to advocate and spread awareness and education year-round, it is always exciting to give a little extra effort in November. Last year, we had 30 days of interviews with people affected by epilepsy. I was quite honored to highlight the stories of people living with epilepsy or those who lost a loved one to epilepsy or those advocating to spread awareness and education about epilepsy. If you have a chance, please read these amazing stories of hope and inspiration. This year my focus is on advocacy organizations and I have several interviews lined up. Since taking over Robert’s care, I have become involved in the epilepsy community and it is amazing to me how many organizations there are to help those with epilepsy as well as their families and caregivers. November is also National Family Caregivers Month so this is a perfect storm for highlighting advocacy organizations. Each of these organization offers something unique and special. Whether the organization raises millions of dollars for research or raises money to fund the purchase of a service dog or is there for support or to tell stories, these organizations have several things in common: their heart, their commitment and their desire to bring about change. I am happy to showcase these organizations and appreciate their taking the time to be interviewed. Today, I am absolutely thrilled to bring you an interview with Tracy Dixon-Salazar, PhD, an Associate Research Director of Citizens United for Research in Epilepsy (CURE). I almost fainted when she agreed to the interview and I owe a special thank you to the phenomenal and generous Christy Shake for introducing me to Tracy and to Susan Axelrod for her support of the interview. Tracy has been a volunteer on the CURE Research Review Board since 2006 and joined CURE as a Research Manager in 2013. Tracy received her Ph.D. in Neurobiology from the University of California, San Diego where her dissertation focused on the role of immune molecules in normal brain development and plasticity. She went on to do a post-doctoral fellowship where she identified genes that underlie epilepsy and studied their disease-causing function using induced stem cell and animal models. Tracy’s desire to get a Ph.D. was inspired by her daughter, Savannah, who suffers from Lennox-Gastaut Syndrome type epilepsy with no known cause. She is a staunch epilepsy advocate and has worked with numerous organizations to communicate epilepsy research to families and to instill the hope that by working together, one day we will find a cure for this devastating disorder. As Associate Research Director, Tracy will use both her expertise as a researcher and her passion as a Mother of a child with epilepsy to further our mission of finding a cure for epilepsy. Now, please join me in learning more about CURE. 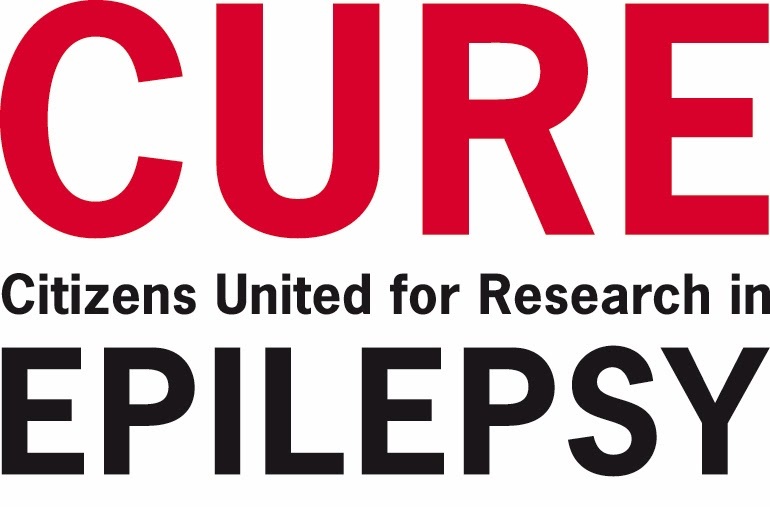 CURE, Citizens United for Research in Epilepsy is a nonprofit organization dedicated to finding a cure for epilepsy by raising funds for research and by increasing awareness of the prevalence and devastation of this disease. CURE, Citizens United for Research in Epilepsy, was founded in 1998 by parents of children with epilepsy who were frustrated with their inability to protect their children from the devastation of seizures and the side effects of medications. Unwilling to sit back and accept the debilitating effects of epilepsy, these parents joined forces to spearhead the search for a cure. CURE’s mission is not only driven by the pressing need for scientific research and data, but by the painful struggle of families who suffer from epilepsy worldwide. Lack of understanding of the prevalence and potential devastating effects of epilepsy is a major problem in our society today. Because the public generally does not know what epilepsy is, and how life altering it can be for the many patients and families who have it, this leads to basic misconceptions about epilepsy in general as well as a significant lack of research dollars being spent to find a much needed cure. CURE is working to change that! Epilepsy, or more accurately, the Epilepsies, are a diverse group of neurological disorders characterized by recurrent seizures. It is estimated that up to 50,000 deaths occur annually in the U.S. from status epilepticus (prolonged seizures), Sudden Unexpected Death in Epilepsy (SUDEP), and other seizure-related causes such as drowning and other accidents. Sudden Unexpected Death in Epilepsy (SUDEP) accounts for 34% of all sudden deaths in children. 2.2 million Troops have served in the current Iraq and Afghanistan conflicts; it is estimated that 440,000 of these soldiers will experience traumatic brain injury (TBI) and more than 100,000 of these soldiers are expected to develop post-traumatic epilepsy (PTE). CURE fund research grants every year in our search for a cure. CURE also host numerous fundraising events to raise money for research. CURE also just started this really neat new Seminar Series where we bring cutting-edge epilepsy research to Universities around the globe. Since its inception in 1998, CURE has raised more than $26 million to fund research and other initiatives that will lead the way to a cure for the epilepsies. CURE funds seed grants to young and established investigators to explore new areas and collect the data necessary to apply for further funding by the National Institutes of Health (NIH). To date, CURE has awarded 151 cutting-edge projects. CURE has advanced the search for a cure in so many ways, it’s hard to describe them all here. Check out this link to learn more. I remember the first seizure vividly. I awoke to the sound of choking coming from the room of my two-year-old daughter, Savannah. I entered to see her tiny little body jerking about violently in her bed. My husband and I didn’t recognize this as a seizure—we thought she was choking. I’ll never forget the words of the paramedic that night who said, “her airway is clear, but what you just described sounds just like a seizure.” That was our harsh induction into the world of epilepsy. Living in that world has been equally harsh. Savannah’s seizures worsened despite treatment. By age three, she was having multiple types of seizure and had to wear a helmet. By age four, she began to have clusters of seizures that would last for hours unless drug intervention was used. By age five, she was seizing dozens of times a day, and delays in her development were becoming apparent. Savannah was diagnosed with Lennox-Gastaut Syndrome, a severe epilepsy with a poor prognosis. Despite dozens of tests though, no cause for Savannah’s seizures was ever found, and with no family history or precipitating event, we were mystified. It has been devastating to watch what epilepsy has done to my child. With over 35,000 seizures in seventeen years, it has definitely left its mark. At twenty, Savannah is the developmental age of a five year old. Her face bears the scars from falls caused by seizures, and her heavy eyes tell of the medications she takes to “control” them. Due to these medications, she drools incessantly, is frequently constipated, has overgrown gums, staggers like a drunk, struggles to find words, and sports a not-so-feminine mustache. The first thing I do every morning before getting out of bed is place my hand on Savannah to see if she’s breathing. With frequent tonic-clonic seizures during sleep, I fear that one will claim her life, and one day she will be gone. Because of her developmental delays, Savannah doesn’t fully realize how her life is different because of epilepsy. She has a childlike happiness, with an infectious giggle and the most loving soul I’ve ever met. But I know, and it torments me. She will forever be dependent on others for her well-being, and is prone to being taken advantage of by the dishonest. She must continue to take anticonvulsants despite side effects, because the alternative is much worse. She will continue to miss out and be excluded because of unrelenting seizures. And I will continue to live in fear of her death, but I expect that I will see it in my lifetime. What I want more than anything is a cure. Sadly, there is no cure for Savannah. Perhaps, with maturity, she may stop seizing one day, but the damage is done. If only there had been something to help her in the beginning. My hope is that someday other children with epilepsy and their families won’t have to live the ordeal that we have, and so I’ve have chosen a career as a researcher. During those early years of seizures and utter confusion, I began to read all I could about epilepsy. The papers I was reading were too advanced and I thought I needed to go to college to take some English classes. But, I soon learned that it wasn’t English I needed, but science. So I took my first science course and became completely enamored with the subject. I attended classes while my children were at school, and stayed up late to study. Fifteen years later, I have a PhD in neurobiology and am an epilepsy researcher. As both a mom and a scientist, I have a great respect for CURE. An organization that recognizes the ravage of epilepsy and takes an active role in the search for help, CURE has inspired hope among parents and dialogue among researchers about curing this exasperating disorder. CURE’s impact has, thus far, been significant, and I am honored to be a part of this group. Update: About 18 months ago, things changed. We learned that Savannah had genetic mutations in numerous calcium channel genes and we knew from previous experience that calcium supplements made her seizures increase substantially. Therefore, her doctor wondered if using a calcium channel blocker might help her... and it did. For over two years Savannah would go into non-convulsive status epilepticus every 2-3 days and would require rectal diazepam to stop these non-stop seizures. In the last 18 months, Savannah has only needed emergency rectal medication 3 times. We are amazed! For the first time in more than 15 years, a medication is helping stop Savannah’s seizures. We are cautiously optimistic that our days of recurrent status epilepticus are behind us and we are hopeful that perhaps trying other types of calcium channel blockers will one day make her seizure-free. If you’re going to dream, dream big! CURE, to me, is hope. I found CURE at a time my daughter had suffered over 18,000 seizures and failed 17 different treatments. I had lost hope and felt utterly alone in our battle with epilepsy. But then I met the mothers and fathers of CURE and my hope was renewed. Here was a group of individuals, many who had children suffering from severe epilepsy as we were, who refused to give up without a fight. They believe, as I do, that research is the key to helping patients with severe, unremitting seizures. I began volunteering for CURE in 2006 and have never looked back! We are truly grateful for the awareness you are creating with your blog. It is so needed!! Thank you!!! Also, 93 cents of every dollar raised at CURE goes directly to research. I love that! Please view our GET INVOLVED page for the many ways you can support CURE and epilepsy research! Robert’s Sister: My extreme thanks for your time and for all that you do! I am still in awe of Tracy for getting a PhD in order to do learn as much as possible about epilepsy and to help her daughter and others with epilepsy. Can this woman get a Mother of the Year award, please?